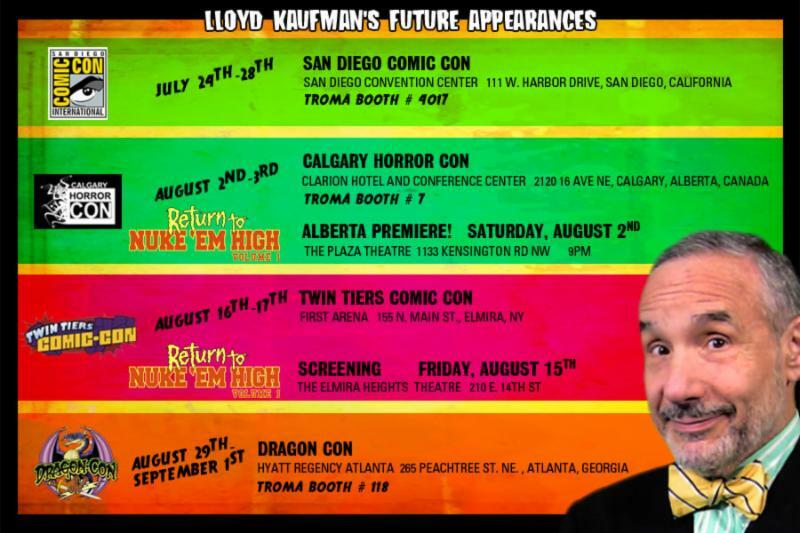 Join Lloyd and the Troma Team July 24th-27th at the annual San Diego Comic Con! After all of the excitement in the ring and out of the ring at Miami SuperCon – including the Miami Premiere of “Return to Nuke ‘Em High: Vol. 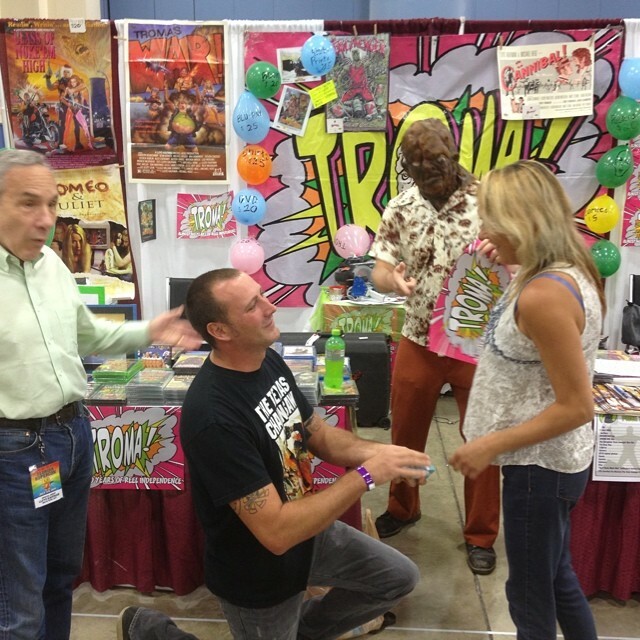 1,” the professional wrestling debut of the “Toxic Avenger,” and two fans’ very special surprise engagement at the Troma Booth inspired by Lloyd & Pat Kaufman, Troma Entertainment gets ready to head into the biggest show of the year. 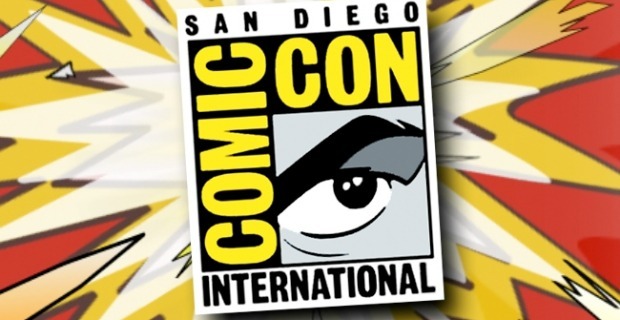 The San Diego Comic Con is a world wide phenomenon. Cosplayers, Artists, Comic Book & Toy Collectors, and Celebrities from all corners of Pop Culture make their yearly pilgrimages from across the globe to come together in one place for four days dedicated to their favorite fads, fashions, and entertainment. It’s also one of the most exciting times of the year for Troma fans as you never never know what is going to be going on at Troma Booth or who is going to stop by. WWE Superstar Dolph Ziggler, Guardians of the Galaxy director James Gunn, The Office‘s Jenna Fischer, and the Soska Sisters pictured below are just some of the stars who have come by Troma’s San Diego Comic Con headquarters to participate in the Trom-activity! This year the Troma Booth is #4017. Liz Lee star of MTV’s hysterical reality show “My Life As Liz” and self-admitted Fangirl. 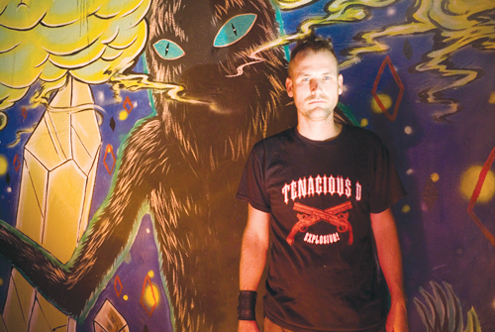 And also reuniting with Lloyd on the panel will be Actor, Comedian, Host of his own web television show, and Filmmaker – “The Angry Video Game Nerd himself, James Rolfe. Every time these two get together it is viral and comedic gold, we’re sure this panel will be no different! 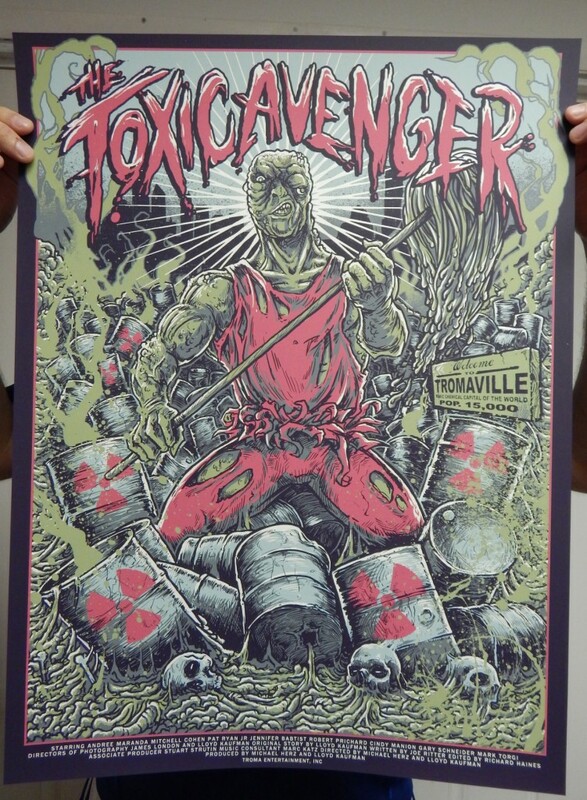 Troma will also have Limited Collector’s Edition Tromabilia EXLUSIVELY for our fans at San Diego Comic Con like Toxic Avenger & Sgt. 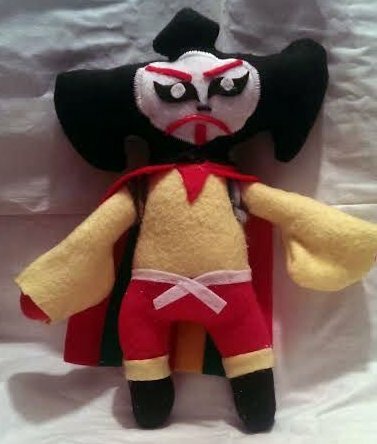 KabukiMan NYPD Plushies from GBJR Toys. Surf Nazis Must Die action figures from GoodLeg Toys, Toxie Beer Glasses, limited high-quality screen-printed posters from Warpaint and Grey Matter Art as well as all of your favorite Troma films and Troma merch that you’ve come to expect will all be available at the Troma Booth. And like always Lloyd Kaufman never charges for his signature on any Tromabilia or for photographs! 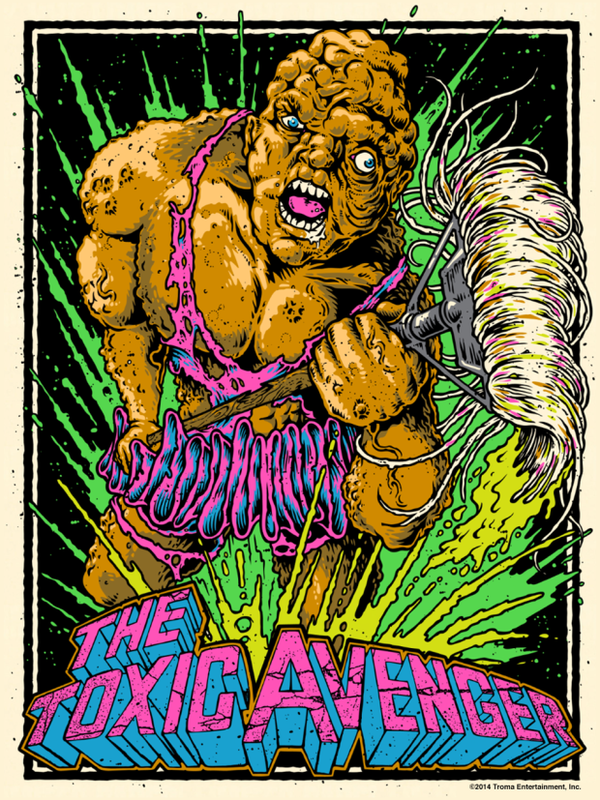 Join Lloyd, Toxie, the Tromettes, and the rest of the Troma team July 24th-27th for a Fan-toxic four days at the San Diego at the San Diego Convention Center for San Diego Comic Con. 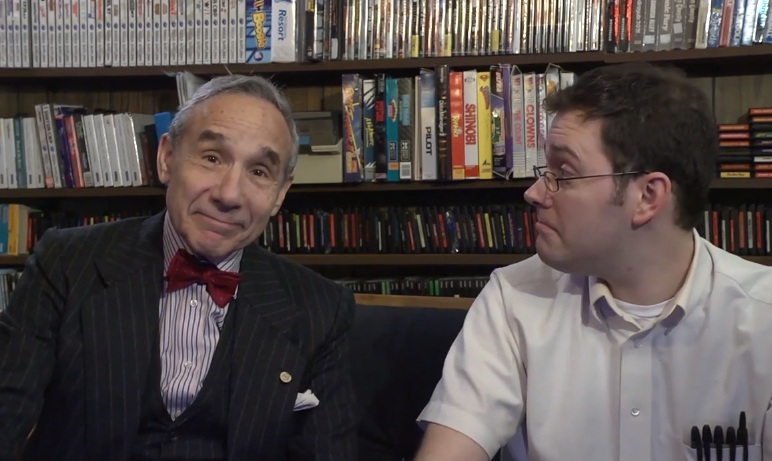 Keep up-to-date on all Lloyd Kaufman’s Future Appearances! This entry was posted on Wednesday, July 24th, 2013 at 3:02 pm	and is filed under Events, News. You can follow any responses to this entry through the RSS 2.0 feed. You can leave a response, or trackback from your own site.